A Wake County neighborhood is cleaning up after a strong storm brought down trees and crushed a shed. DURHAM (WTVD) -- A Wake County neighborhood is cleaning up after a strong storm brought down trees and crushed a shed. This happened near Mal Weather Drive not far from the Johnston County line. Click here to view the latest weather advisories. Click here to download the ABC11 First Alert Weather app. On Silver Farm Road, a tree came crashing down and narrowly missed a pick-up truck. Branches were wrapped around the truck. Residents in the neighborhood said a straight line wind caused the damage after 4 p.m. Friday. "It was really suddenly where the wind really picked up and about quarter sized hail," said homeowner Jason Schlafer. "I just grabbed my daughter, and we went into our spare bathroom so we could kind of seek cover because I thought it was a tornado coming because the wind was so hard and the rain was coming down so hard you could see anything." Electricity briefly went out but was quickly restored. Some people started cleaning up the debris Friday, others are waiting until weekend. Saturday will be cloudy, and showers and thunderstorms will result in lower temperatures. However, it will remain humid. Some thunderstorms could contain damaging winds, hail and flooding downpours in the evening. We remain under a slight risk for severe weather as an area of low pressure approaches from the northwest. Highs will be in the upper 80s and lower 90s. "The storm system will move away from the Triangle on Sunday morning," said Horton. "Drier air will move into the area and bring a less humid day with plenty of sunshine. It will actually be much cooler, with below average temperatures." Sunny days are expected early next week with temperatures rising to typical levels 90. 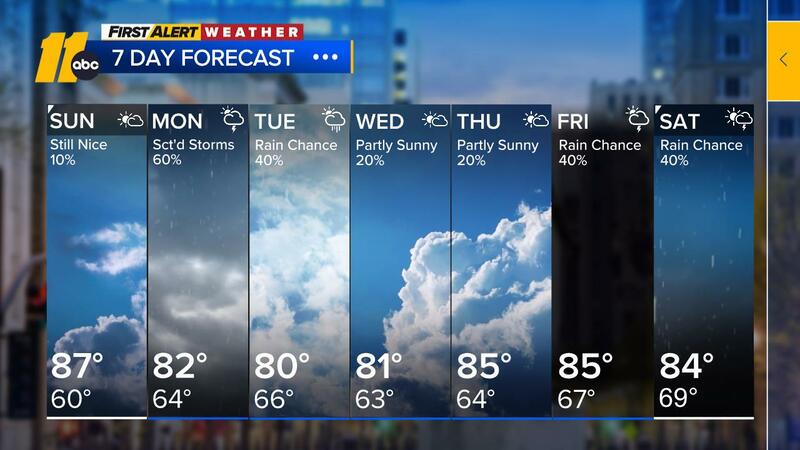 Click here for the latest weather forecast.